Chennai based company Altius Scimiter showcased two motorcycles at Defence Expo 2014, which was held at Pragati Maidan. A single cylinder 650cc and the other one being parallel twin diesel motorcycle concept showcased at the Defence Expo. Ex-Tata and Ex-Hyundai man, BVR Subbu made an announcement back in 2011 to launch the 650cc single cylinder diesel off-road motorcycle in India. 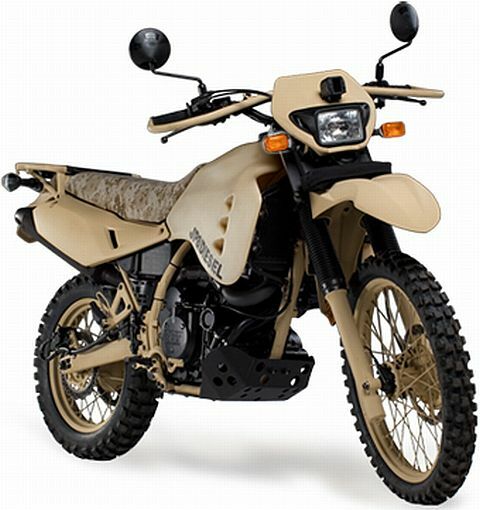 Originally developed for the US military, the civilian version of the Hayes Diversified Technologies (HDT) 650cc is based on the Kawasaki KLR650. HDT fixes these diesel engines into the Kawasaki KLR650 chassis, to make this motorcycle go anywhere. The single cylinder four stroke 650cc mill generates 33 bhp and and 53 Nm of peak torque. The bike comes equipped with 14 liter fuel tank with a range of 600kms in full tank and can achieve a top speed of 150kmph with 90kmph cruising speed. The engine is held by a tough steel frame that is strengthened to take the rigors of off-roading. The engine runs on various fuel types including biodiesel, diesel and even aviation kerosene. Designed for extreme conditions with reliability a prime concern, the 650cc features numerous structural reinforcements – such as heavy duty wire-spoke alloy rims and a beefed up bash plate. It weighs 168kg in total. To achieve good power, an advanced, thermally robust, free-breathing four valve cylinder head is used. Indirect injection also gives lower combustion pressures enabling lighter engine construction, less ‘diesel knock’ and low particulate emissions. BVR Subbu also said that the localization level is now 90% for this and we speculate that the bike will be launched in upcoming months in India. Though we are not sure about how much money one has to shell out for this motorcycle, this oil burner will be a touring dream for Indian automobile enthusiasts for sure.